Join Muluken Girma of Merit Ethiopian Experience Tours for an exquisite holiday in the land of rich history and culture, Ethiopia. You will experience the majestic Ethiopian natural beauties and wonders, the range of fauna and flora, the wildly galloping wild animals, the multifarious cultural colors, the glorious history of the Ethiopian people, and of course, the authentic Ethiopian cuisine. Sidama Lodge will be your home in Addis Ababa. Sidama Lodge gets the name from the Sidama region of Ethiopia, the home of the Sidamo coffee. The area is characterized by lush green countryside making it known as the garden of Ethiopia. It is inhibited by the Sidama people who speak Sidamic and have their own history and culture. Sidama Lodge provides a home for many artists to display their work providing a unique and relaxing environment for the guests at the lodge. Each bedroom has at least one piece of original art. You will be staying at Lewi Resort during your time at Awassa. The resort is traditional thatched, beautifully appointed, and environmentally conscious, which makes it a unique place. The construction is made on the natural landscape of the place. Majority of the rooms on the lake side are designed with a balcony to enjoy the incredible view of the lake. The traditional village by the lake side has cultural restaurant, wine bar, storytelling places, kids play ground, table tennis, badminton, souvenir shop, and so much more. 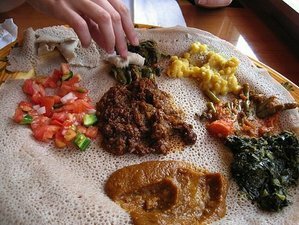 During the tour, you will learn how to prepare enjera which is the typical Ethiopian pancake. You will visit few interesting sites of Addis Ababa and the Rift Valley Lakes of Ethiopia. Your transportation during the tour will be a comfortable private 2014 Toyota minivan with six seats capacity equipped with air conditioning and seat belts. On your first day of the tour, you will visit the National Archaeological Museum of Ethiopia where the fossil remains of Lucy is stored. You will visit Merkato, the largest open air market in Africa and the Holy Trinity Cathedral, and then drive to the peak of Mount Entoto to have a panoramic view of Addis Ababa and visit the oldest church in Addis Ababa. You will stay at Sidama Lodge for the night. On your second day, you will drive 250 kilometers south of Addis Ababa visiting the Rift Valley Lakes of Ethiopia and with secession to learn how to prepare enjera at a local family's house at the town of Ziway. You will have lunch at this house. Late in the afternoon, you will enjoy bird watching and the sun set over Lake Awassa. You will spend the night at Lewi Resort. You will drive back to Addis Ababa via the town of Butajira and visit the steles of Tiya (14th century AD and UNESCO World Heritage Site), the rock hewn church of Adadi Mariam (13th Century AD), and you will also visit and participate in the preparation of a local food called kotcho which is prepared from enset or false banana tree. This culinary and cultural tour will take place in Addis Ababa, Awassa, and Ziway. You will learn how to prepare authentic Ethiopian dish such as enjera and kotcho. There is a spa center at Lewi Resort in Awassa. You can enjoy a variety of treatments at additional costs. Please book your flight to arrive at Addis Ababa Bole International Airport (ADD). Merit Ethiopian Experience Tours [MEET] is local tour operator offers small group private guided cultural, culinary, & nature tours in and around Addis Ababa.